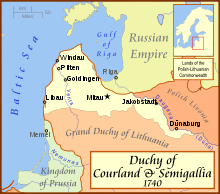 The Duchy of Courland and Semigallia was a duchy in the Baltic region. It existed from 1562 through 1795. It was a vassal state of Grand Duchy of Lithuania and later of Poland-Lithuania. It became independent in 1791, but was annexed by Russian Empire in 1795 during Third Partition of Poland. It had its own empire. One of its colonies was modern day Trinidad and Tobago. This page was last changed on 2 June 2018, at 10:47.